A recent report by Colliers International on the Leeds office market over the last 6 months, reinforced research by Metropolis, showing rising office take-up driven by occupier pre-lets and expansions and a healthy pipeline of new office space on its way in the city centre. After a solid first quarter with office take up of 150,000 sq ft mainly in small deals, came the announcement of Addleshaw Goddard, the law firm, signing a pre-let on 4,645 sq m (50,000 sq ft) of offices at Bruntwood and Kier’s 3 Sovereign Square. Leeds office take up of 549,000 sq ft during 2014, was down on the 2013 total, but 10% above the 5 year average. Large recent deals include: KPMG taking 60,000 sq ft at Sovereign Street, a pre-let of 32,382 sq ft to Squire Patton Boggs at 6 Wellington Place; DAC Beachcroft taking 23,000 sq ft at Boultbee Brooks’ refurbishment of St Paul’s House; FDM goup taking 17,000 sq ft at Whitehall Riverside. Professional Services (notably law firms) and healthcare occupiers were the most active in 2014, but the year also saw deals to Green Flag, BSkyB and TPP. There are about 400,000 sq ft of office requirements circulating in Leeds at the moment. Metropolis is tracking around 25 medium/large searches in the city including PWC, Walker Morris, Equifax and more space for BSkyB amongst others. In terms of development, future Leeds office supply levels are set to be boosted with schemes on site at Central Square, Wellington Place, 3 Sovereign Square and 6 Queen Street which will deliver 450,000 sq ft of office space over the next two years. further new space is also potentially in the pipeline for 2017 could include: Latitude Blue (120,000 sq ft), 5 Wellington Place (70,000 sq ft), City Square House (175,000 sq ft) and the Yorkshire Post Site (200,000 sq ft). There are a series of lease events over 2015-16 amongst the financial services and legal sector tenants in Leeds, which could trigger up to 300,000 sq ft of requirements. There are also over 80 lease expiries amongst smaller firms due to be resolved over 2015 and 2016. 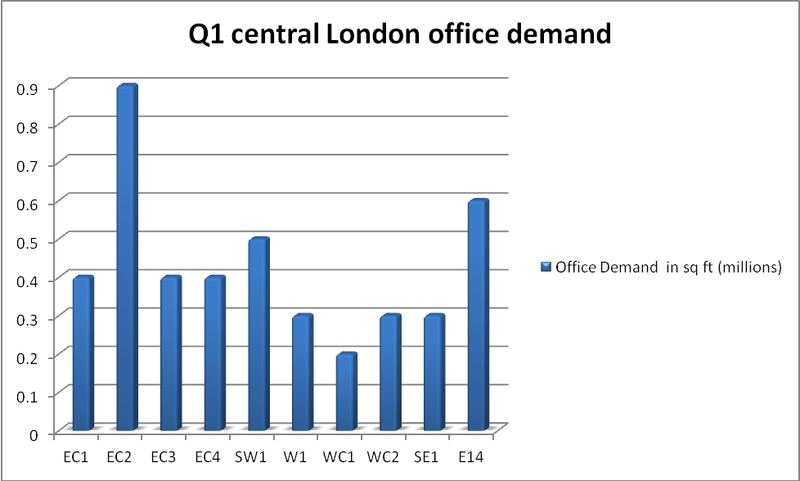 Central London office lettings rose in March 2015 to just over 1.25m sq ft sq ft of transactions in 75 deals during the month. The month was characterised by a return of the large deals, with the 260,000 sq ft pre-let to Deloitte at New Street Square, EC4, the 61,000 sq ft letting to Investec at 30 Gresham Street, EC2 and the 52,000 sq ft letting to Deutsche Bank at the Willis Building, EC3. Other large lettings included deals to Tag Worldwide, Instant Offices and Expedia. Professional services and financial sectors topped the table of lettings by sector, helped by the Deloitte and Investec deals, followed by computer/IT and business services. The financial sector has the largest share of the 3m sq ft of space currently under offer which is likely to convert into deals in the months ahead. There has also been a noticeable surge in new requirements being launched in the London market. By area, the City accounted for over half the deals (43) and 51pc of the floorspace let in the month, while Docklands saw nearly 100,000 sq ft let in just three deals to financial companies. The volume of grade A (newly built or refurbished office space) let during the month increased to over 460,000 sq ft as transactions for newly developed or refurbished space rose again. Metropolis is preparing a spring 2015 report on office space just completed and under construction in London based on its extensive database of planned office schemes. Both Edinburgh and Glasgow recorded strong office demand in 2014 with Edinburgh deals totaling 740,000 sq ft including large lettings to Standard Life, Rockstar and FNZ. In Glasgow take-up reached 686,000 sq ft including large transactions involving Network Rail, Cigna Insurance and Clydesdale Bank. Metropolis reported on 476 deals, expansions and requirements in the Scotland in 2014. 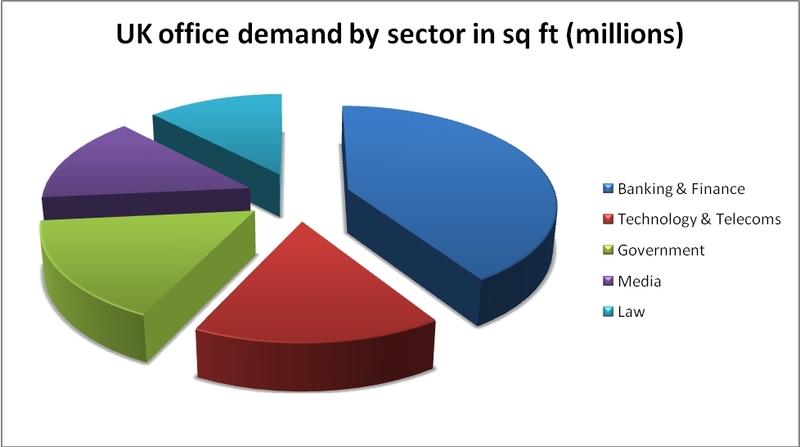 Looking ahead, Metropolis has just completed an analysis of current named office demand in the city centres of Scottish cities. The survey encompasses 80 different companies that have told Metropolis that they are looking for office space in Edinburgh, Glasgow and Aberdeen over the past 12 months 2014-15. The current total of office space required by the 80 companies tracked by Metropolis, is 82,300 sq m (885,600 sq ft) as of April 2015. Edinburgh takes the lion’s share of demand with 41,000 sq m (441,300 sq ft) of named requirements, followed by Glasgow with 38,800 sq m (417,600 sq ft). By sector, financial services dominates by volume (boosted by a large Morgan Stanley search in Glasgow), followed by media and business services. However, it is business services which has the highest number of individual searches, followed by IT, recruitment and media. Public services, including Government agencies, remain an important slice of the market. By size band, 22 searches are 930 sq m (10,000 sq ft) and above; 20 are between 5,000 sq ft and 9,999 sq ft, with the remaining 33 searches less than 5,000 sq ft. Metropolis has analysed the reasons for an office search and lease expiries tops the poll with 58% of searches, followed by expansion on 32% and new office bases on 10%. The predicted upsurge of demand following the referendum has not yet materialised, but the largest current searches are Morgan Stanley, Aecom and Aegis Global in Glasgow, Pinsent Masons, Simpson & Marwick, WS Atkins and EY in Edinburgh. There are nearly 100 companies in Glasgow and Edinburgh approaching lease expiries in 2015 to 2017, including Deloitte, KPMG and Brodies which are yet to make a decision. Local agents are predicting that new redevelopments and refurbishments are imminent due to lack of grade A supply in both cities. A recent report by Colliers International on the Birmingham office market over the last 6 months, painted a picture of rising office take-up driven by occupier expansions and falling availability of office stock in the city. The city is riding high after the announcement of HSBC’s (210,000 sq ft) relocation of 1,000 London staff to the Arena Central scheme in 2019. Office take up of 340,000 sq ft in the second half of 2014, took the yearly total to over 713,000 sq ft for the year, with over 70% of deals in the core area. Large recent deals include HS2 (97.958 sq ft) at Two Snow Hill, HSBC (37,530 sq ft) at 120 Edmund Street BCU (27,000 sq ft) at NTI Building, BDO (24,307 sq ft) also at Two Snow Hill and Weightmans (14,000 sq ft at St Phillips Point. Financial (notably Deutsche Bank) and public sector occupiers (mainly skewed by HS2) were the most active in 2014, but the year also saw deals to Vodafone, Hogan Lovells and Amey. There is about 500,000 sq ft of office requirements circulating in Birmingham at the moment. Metropolis is tracking around 30 medium/large searches in the city including PKF Cooper Parry,, London School of Business & Finance and Birmingham Chamber of Commerce amongst others. In terms of development, Rockspring and Sterling Property Ventures are planning redevelopment of 103 Colmore Row to produce an office scheme of 225,000 sq ft. Bruntwood has purchased the former KPMG Headquarters at 2 Cornwall Street and will begin a major refurbishment and extension of the building this year. Looking ahead, the city is increasingly garnering mid-level banking operations from London, with Lloyds Bank the latest rumoured to be interesting in boosting its presence in Birmingham. The lack of new schemes and grade A office space across the city is now likely to trigger enquiries from a number of occupiers. There are also over 100 lease expiries due to be resolved by Birmingham tenants over 2015 and 2016.